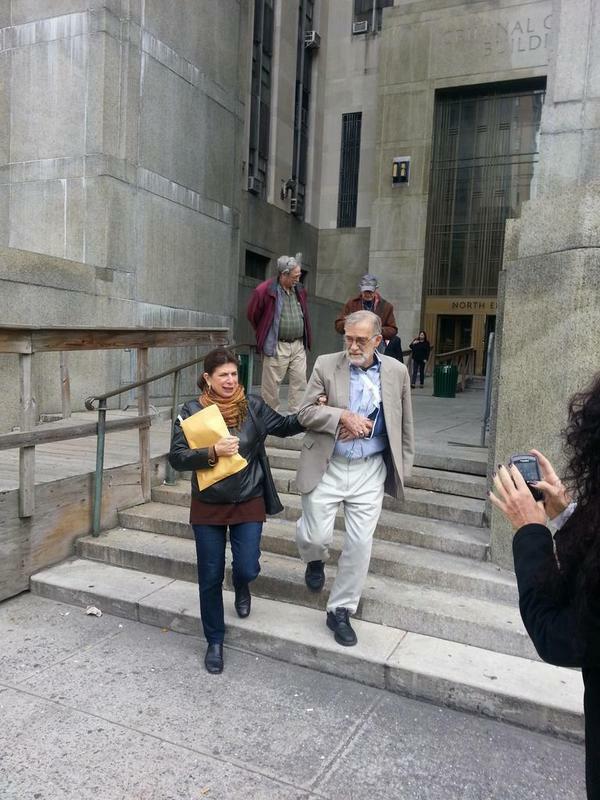 Former CIA analyst and activist Ray McGovern was arrested [on October 30] as he attempted to attend an event in New York City featuring former CIA director and retired military general, David Petraeus. He was charged with resisting arrest, criminal trespass and disorderly conduct. At 92nd Street Y, which describes itself as a “world-class cultural and community center,” Petraeus was to appear with John Nagl, who recently wrote a book, Knife Fights about being an army tank commander in the Gulf War of 1991. Neoconservative commentator Max Boot was to join them as well. Activists from World Can’t Wait, the Granny Peace Brigade, Brooklyn for Peace and a chapter of Veterans for Peace called on people to protest. Some tickets, which cost $45 each, were bought so people could attend the event and potentially participate in a question and answer portion of the event. World Can’t Wait activist Stephanie Rugoff said a guard stopped McGovern. “Ray, you’re not going in,” the guard said. McGovern, who is 74-years-old, told the guards something to the effect that the Bill of Rights gave him the right to go into the event. McGovern had a ticket too. But the guards would not let him pass and soon New York police officers surrounded him. Richard Marini, also an activist with World Can’t Wait, approached the entrance to the 92nd Street Y Center and saw McGovern being apprehended. According to Marini, his arms were twisted tightly behind his back and he was in immense pain while they were dragging him to the police car. He was squeezed into the back of a patrol car and taken to the 67th Street station. Rugoff heard him screaming. He was shouting about how they were hurting his shoulder. He asked the officers to stop twisting it so they did not aggravate his shoulder and possibly re-injure it. All of this happened just before 7:30 p.m., when the event had been scheduled to start. Although Marini had stood up in a previous event and interrupted conversation, he said he planned to wait until the question and answer session to engage in any kind of protest. That was McGovern’s plan too. Marini recalled a previous occasion at the 92nd Street Y Center where security came and ejected everyone before the event started. So, authorities have managed to figure out who is coming to protest. The world-class community center has had multiple events featuring Petraeus. It brings in security and the NYPD to effectively protect him from dissent. After McGovern was arrested, Rugoff explained that people did not think the center would let anyone in. They also wanted to go to the precinct and check on McGovern instead of staying for the event. “We got to the police station, and they were still dragging Ray around. His watch strap was broken and there was some blood on his wrist,” Rugoff stated. McGovern was transferred to the 100 Centre Street police station and put in central booking. He is expected to be arraigned in the late morning or early afternoon. Previously, McGovern was placed on the State Department’s Diplomatic Security “Be On the Look Out” (BOLO) list. He turned his back on Hillary Clinton at event at George Washington University in 2011. The disorderly conduct charges he faced were eventually dropped, as it was found he committed no crime. McGovern obtained documents through the Freedom of Information Act that showed he had been investigated by the State Department, which was interested in his “political beliefs, activities, statements and associations.” He sued the State Department for violating his First Amendment rights and won an injunction against the State Department in September to halt the “Be On the Look Out” alerts for McGovern. How security or the NYPD knew McGovern and the other activists by name and that they would be at the event is unknown at the moment. Whether an alert system like the alerts used by the State Department was involved to tip off security to their presence is also unknown as well. What matters is individuals bought $45 tickets to an event and were effectively denied entry to protect Petraeus and Nagl from having to face possible questions that might challenge their military backgrounds and defense or involvement in war crimes previously committed by U.S. military forces. McGovern has been released. He appears to have a black eye in the photo of him leaving 100 Centre Street police station. However, on Monday, he fell and hurt his shoulder. That’s from the fall. His injury is why he was screaming when police were aggressively handling him as he was dragged to the police car.